Buy your favorite items online. Let us plan your special occasion. 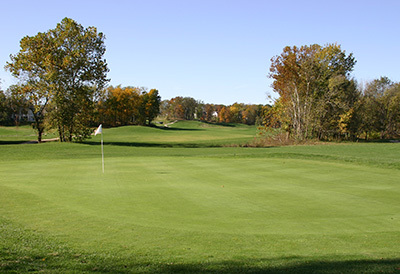 When it opened in 1998, Bear Creek Golf Club was the first 18-holes public golf course in the City of Wentzville. The course is one of the premier public facilities in St. Charles County. The full service Pro Shop offers annual passes to the surrounding homeowners and general public. Leagues, lessons, and tournaments are available to all levels of golfers and are scheduled throughout the season. The on-site driving range and short game practice facilities are open to daily patrons as well. The club hosts many large corporate, private, and public golf tournaments during the daytime hours. As evening approaches, the ambiance becomes quiet and peaceful, transformed into a haven for elegant wedding receptions, rehearsal dinners, social celebrations and a variety of parties year-round. Our service and small town charm at Bear Creek Golf Club makes "The Home of the Grizzly" a friendly and fun place to play and socialize. Bear Creek Golf Club was designed by noted architect Gary Kern and opened in 1998. The construction of the championship-style golf course included the preservation of most of the trees and natural habitat allowing each hole to have its own unique features, challenges and beauty. Over the years Bear Creek has become known by most of the avid golfers as "The Home of the Grizzly".